Panda presents Mutated Forms. The Drum & Bass trio hailing from Estonia. As new members of the Grid Recordings label, they are currently flying around the world to play at the biggest Drum N Bass clubs and festivals. They have a discography that already includes several Drum & Bass classics and having worked with Estonian singer Lenna Kuurmaa in their debut "Homesick" or "Loomeinimesed" in Estonian at the Eesti Laui 2009 song festival. In this artist-only mix, they show us solely their latest tunes... blended in top speed! Leave your appreciation in the comments! Making music began as a hobby for the trio of producers / djs known as Mutated Forms hailing from Estonia. Original members Alexander (Zub), Artiom (G-ruff) and Alex H started experimenting with different genres of electronic music using any and all software they could find. It was at the beginning of 2004 when MF's tunes first began appearing on various drum and bass CD-compilations. During the course of 2004 they released an album on Prosvet Records, a Russian label, called MF Project No Limits'. The album was mostly jump up tunes but also consisted of liquid funk and a few experimental tracks and was well received by the drum and bass audience and critics, gaining the MF team further recognition. Then in 2005 they released again on an experimental label called Exegene Records. In recognition of their up-coming talent, UK drum and bass pioneer and label boss of the mighty Formation Records, Dj SS began keeping a close eye on their music and progress. It was their track My Feeling that finally got released on the Formation powered imprint World Of Drum'n'Bass Records catapulting the trios music further towards the mainstream of drum and bass music. Not content at reaching this goal, quickly followed a release on Formations sister label New Identity, proving their value as international drum and bass artists. Their studio productions are individually unique, never reliant of formulaic trends, each being notably different from the last, but all in all sprinkled with that distinct Mutated Forms magic. With these dance floor friendly sounds, and wobbly liquidness, it is no wonder the likes of dnb heavyweight DJs such as Fabio, Hype, SS, Grooverider, Sappo are currently supporting their tracks on the circuit. Their popular ultimate dance floor sound as producers mirrors their live performance as DJs, balancing versatile and dynamic sets capable of pushing the boundaries of techy, through to jump up sound with lick of funk. Whatever gets the dance floor moving! 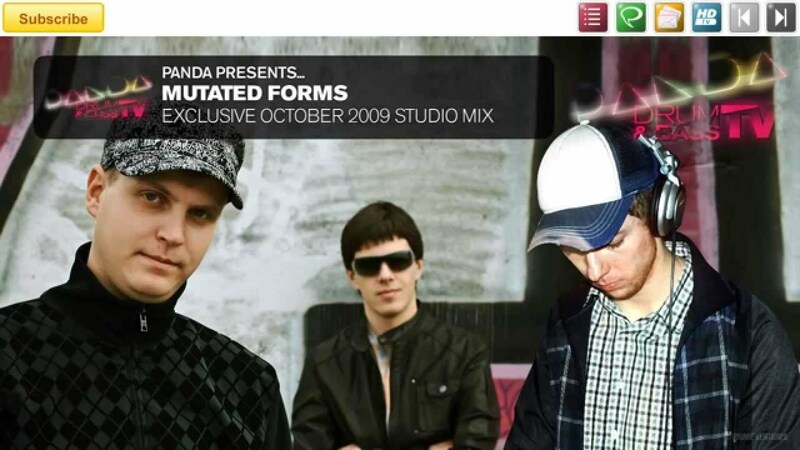 Now firmly entrenched and supported by the Grid camp, the Mutated Forms trio are fast becoming hot property on the international drum and bass circuit. keep your ears out for Mutated Forms with their forthcoming releases on Grid Recordings. Mutated Forms are fast becoming hot property on the international drum and bass circuit. You can catch them on dance floors across the globe and in their regions Estonia, Latvia, Russia, Slovakia, Finland, and Lithuania where they are best known for their live skills so far.